Would be a great place for another small pub, could have some outdoor seating, etc. I do suspect the south facing side and the concrete will need too much work to make it viable. Absolutely. Some of those trees might have to be trimmed/cut down. Not sure what, if any, kind of damage those trees have done to the foundation/structure of the building. I am curious what kind of shape the building is in. Of course, once something does get put in there, get ready for the "Where is everyone going to park?" comments even though there is a huge parking lot south of it. 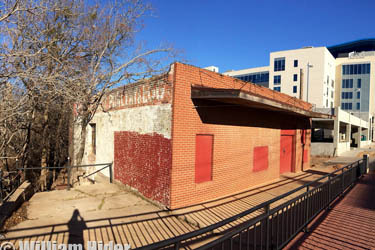 It would be cool for Jim Thompson (owner of aLoft) to buy it and make it a restaurant and people can park in the aLoft parking garage. It was open the other day so I walked in and looked around. There was a ladder and some minor construction tools lying around. It's a lot bigger than I thought. I figured something was going to happen with it. 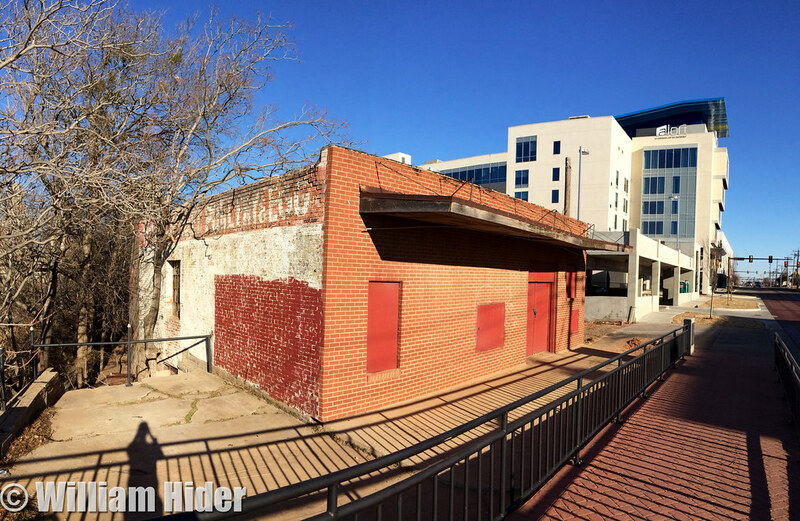 It would be cool for Jim Thompson (owner of aLoft) to buy it and make it a restaurant and people can park in the aLoft parking garage. I'm cool with this idea, but I want him to fill the Aloft restaurant space first. We look in this building often, it gives a "haunted" feel to it at night. I really like it. However, it looks like a lot of work from the outside. The foundation looks pretty washed out and the tree roots look to have a part in this. Bulldozer may be only feasible option. Obviously saving the building would be preferable, but a new structure on this site would be okay. I was shocked that Aloft didn't buy it originally to incorporate into their site. I will try and get some more photos of this place. I have been wanting to, already. Not sure the address of the small building just south of Aloft, but it seems ripe for development, especially with all the outdoor space who owns it? Feel free to separate this into its own thread. Every single time I walk by I dream of opening a bar there. I also didn't realize there was that much space back there. That would make an awesome beer garden. Yeah. I couldn't believe how much space there was in the back. 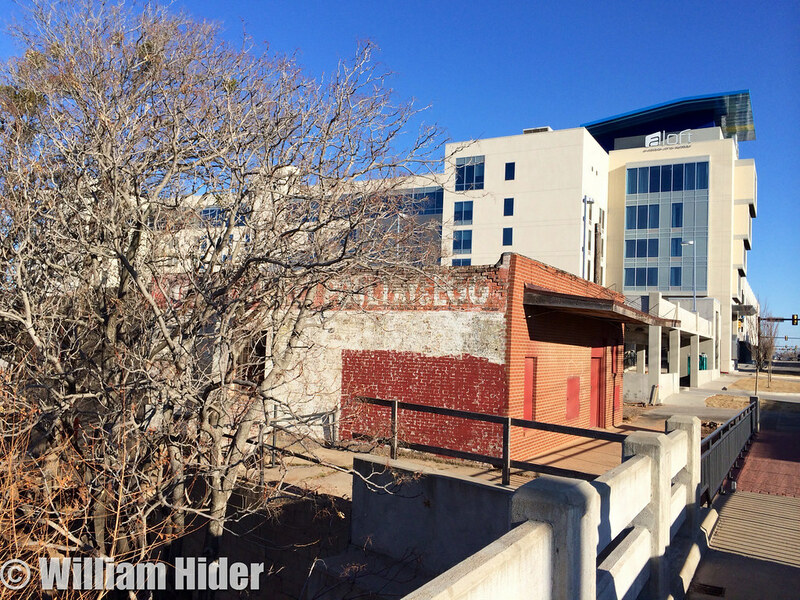 It really could be an incredible environment as its sunk in next to Aloft, but the trees could be trimmed to still provide a nice view of Bricktown/downtown. It's been owned by the same group for the last nine years. Don't know what they are waiting for... Either develop the property or get it in the hands of someone who will. Could be so cool. It's about 2,100 square feet on almost a quarter acre, so there is lots of potential. I think a coffee shop would be a great fit. Every building doesn't have to be a bar or dinner restaurant, especially if we are building a neighborhood and not just a district. We need daytime uses to balance things out. Also, someone should report this property to the City's action line for graffiti. If the property owners start getting fined, they'll be far more motivated to do something with the property. If we are simply going off of nearby concepts, there are 6 bars (including restaurants with serious bars) within a block, and only 1 coffee shop. Perhaps a breakfast diner with a lunch patio?